You'll find lots of people able to spot you anything you need. I'm checking to see what the opinion is on moving this competition one weekend earlier to October the 4th. This is the Saturday in the long weekend. This isn't an actual change until I hear back from the people who've already said yes to the advertised date. Long weekend would put me out, I can probably grab another mate to sign up for this too. There will be no date change. The competition will run on October 11th as originally advertised. The Hobby Matrix has once again kindly donated a significant amount of store vouchers for prizes. I'd encourage everyone to come along to have a chance at winning one of these. The prize break down will come later but is likely to be a voucher for the top 3 finishes on each side. And I've even see a stray Jar Jar floating around for people to compete for. 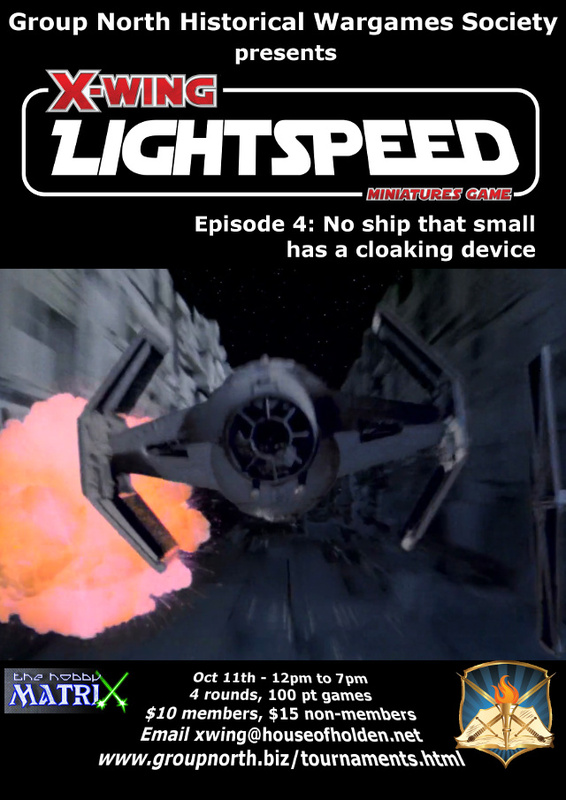 Lightspeed is expanding to run a juniors X-Wing competition at the same time. The junior event is $7 for club members and $10 for non-members and is available to anyone 15 years or younger. The competition will start and finish at the same time as the main event however it will consist of 3 rounds. 2 rounds will be dog-fighting and one round will be one of the Lightspeed missions. The same Rebel versus Imperial matchup will be used. The results of the junior competition will be combined with the adult competition to decide the overall winning force of the day. Best pilots will still be decided seperately. Any juniors interested in the event can register here or email xwing@houseofholden.net. I might be attending this one as well. Got my starter set, just need a coupe more ships. If I shave can I play in the junior tournament ? I probably can't let you play with the kids, but I'm sure we can scrounge up any ships you might desire if you can't get them yourself. Lots of the 'old guard' players by now have lots of spare ships in their fleets. Cool cool, I got 4 tie-fighter, 1 Fire spray, 1 tie Interceptor,1 tie-phantom (on its way) and what else I'll buy until October ^^. So I should be good. I might need to come to one of the gn meetings to get some practice ^^. The Players Pack has been released. The senior event covers all 4 missions, the junior the first 3. The standard dog-fights are normal. The other two missions feature standard dog-fighting with extra conditions to give the fleet you fight for more victories. In these missions you'll either be trying to get your own win, or trying to get as many points for your fleet to win (and the best will just do both). The area control mission is basically a capture the flag type and the hunt and escape is a basic shoot the targets or escape the board. All the full details are in the players pack. Note that the scenarios may be tweaked between now and the competition. Any changes will be updated on this forum. Will shoot through the money, I only have rebel ships - Andreas plays imperial. My 3 Defenders have finally arrived. Now will I have the guts to fly a Defender "swarm"? No problem. Numbers aren't finalized till on the day, though early bird payments do go into the raffle for a voucher to our sponsor The Hobby Matrix. Also the earlier you can pay the better chance you have of locking in the faction you want to be (late comers may be asked to play a specific faction to balance out the forces). Mission 2 in the players pack was found to have balance issues. It's being re-written and tested again. It'll still have the same goal of control of satellite tokens and the chance to earn extra victory points for your fleet. Just a bit over a month to go. It's time to start nominating the faction you want to use so we can balance out the forces.